We’d love your help. Let us know what’s wrong with this preview of Language at the Speed of Sight by Mark Seidenberg. To ask other readers questions about Language at the Speed of Sight, please sign up. Well, I bought it but wish I'd waited until the library copy came in. The book was kind of all over the place, from science to education policy to curriculum critique to everything in between. Spoiler alert: phonics are important and the way to go for instruction. Unfortunately, I've read other books on the science of reading and I already knew that. He doesn't give many specifics on which curricula do work other than "phonics." Okay, but there are a lot of different ways of teaching phonics, an Well, I bought it but wish I'd waited until the library copy came in. The book was kind of all over the place, from science to education policy to curriculum critique to everything in between. Spoiler alert: phonics are important and the way to go for instruction. Unfortunately, I've read other books on the science of reading and I already knew that. He doesn't give many specifics on which curricula do work other than "phonics." Okay, but there are a lot of different ways of teaching phonics, and he doesn't really distinguish between them. I kept feeling an irritated sort of suspense--when is he actually going to tell me something specific about the reading process and what works? Never happened. I did get a lot of background I didn't need or already knew. And I wish he hadn't been so dismissive of comprehension issues. There is a subset of kids who are hyper Lexi can, so they've clearly cracked the phonetic code but still don't necessarily know what they're reading. Some info that I found valuable on the disconnect between teache I kept feeling an irritated sort of suspense--when is he actually going to tell me something specific about the reading process and what works? Never happened. I did get a lot of background I didn't need or already knew. And I wish he hadn't been so dismissive of comprehension issues. There is a subset of kids who are hyper Lexi can, so they've clearly cracked the phonetic code but still don't necessarily know what they're reading. Some info that I found valuable on the disconnect between teacher training and scientific evidence. He was most persuasive to me when he spoke re the cult of personal observation. I've noticed this too. I had a feeling I'd enjoy this book, but I was much more entertained than I expected to be. Seidenberg has a great sense of humor and wit about him. (Non-fiction books about reading can be a little dry. This one was pretty funny at times.) Plus, it was fascinating and informative. I'd put it in the same category as Maryanne Wolf's Proust and the Squid and Stanislas Dehaene's Reading in the Brain. It's that excellent. The latest title in an exceptionally great year or so of education reading (i.e., arguably the best-ever ED Hirsch, Michaela's 'Tiger Teachers', new K Chenoweth, Didau/Rose, Crehan's 'Cleverlands', etc., all with Boser, Ericsson, Peal, Hess, & Willingham on deck), and possibly the most important. Really saying something, considering all the high-quality stuff I've read of late. Though 'Language at the Speed of Sight' focuses mainly on the science of reading, the few dozen pages of chapters 10 The latest title in an exceptionally great year or so of education reading (i.e., arguably the best-ever ED Hirsch, Michaela's 'Tiger Teachers', new K Chenoweth, Didau/Rose, Crehan's 'Cleverlands', etc., all with Boser, Ericsson, Peal, Hess, & Willingham on deck), and possibly the most important. Really saying something, considering all the high-quality stuff I've read of late. Though 'Language at the Speed of Sight' focuses mainly on the science of reading, the few dozen pages of chapters 10-12 may be the most potent and letter-perfect critique of American Education -- teacher prep, professional ideals, evidence-resistance, and the like -- I've ever read. Really liked the first part of the book the best - about what reading is and how it works in our brains, especially as contrasted to listening to speech. The big chunk about dyslexia was interesting also. I didn't care as much for the sections about what is wrong with how we teach reading and how it got that way, and possible improvements. Important stuff, and I'm confident he's on the right track - but I guess I'm more interested in the how-it-works stuff as opposed to the social policy stuff. Chapter 11 is a MUST READ for anyone who teaches reading. There is a persistence in the field of some educational strategies (i.e. 3 cueing systems) even though a mass amount of scientific evidence over the past 30 years disproves these methods. This is a technical read with lots of big words and lengthy sentences (one sentence I counted clocked in with 49 words). The basic premise is that reading scientists know a lot about the brain and how it works with regards to learning to read, and their Chapter 11 is a MUST READ for anyone who teaches reading. There is a persistence in the field of some educational strategies (i.e. 3 cueing systems) even though a mass amount of scientific evidence over the past 30 years disproves these methods. This is a technical read with lots of big words and lengthy sentences (one sentence I counted clocked in with 49 words). The basic premise is that reading scientists know a lot about the brain and how it works with regards to learning to read, and their understanding is continuing to grow. What is extremely unfortunate, with detrimental effects on student achievement, is that there is a gap that exists between scientific research and the ways in which educators are educated about teaching reading. Technical book about the state of reading instruction in American schools. Seidenberg blasts away (with humor and wit) at the state of how we teach kids to read without any of the current science. Fascinating. Roughly 40% of American students are reading below grade level. 40%, People! You all are readers and should be mightily concerned because we know that you have to be a skilled reader to properly comprehend health care, education, government, business, etc. Yet our schools don't us Mind blow. Roughly 40% of American students are reading below grade level. 40%, People! You all are readers and should be mightily concerned because we know that you have to be a skilled reader to properly comprehend health care, education, government, business, etc. Yet our schools don't use the scientifically based methods for what works...thus the abysmal scores...Thus the population who can't think through topics or weigh out anything critically. I didn't realize when I picked this up how much of it was focused on teaching kids to read English in the US, because (ironically) I didn't read the title carefully. I'm not a teacher, so the parts about education methods and policy weren't my favorites, but even they included some things I wouldn't have intuited, and the book overall covered some ground it wouldn't have occurred to me to wonder about. A good scientific reading book. This is a fascinating book. It is also difficult, filled with jargon, and seems to expect a lot of previous knowledge by the reader. I looked up a lot of words, but even then, I'm not sure the dictionary meanings help in this very technical context. The first seven chapters or so cover the "How We Read" part of the subtitle, and I loved them. I've always been interested in how reading works. Lately I've thought quite a lot of the difference between reading printed pages and listening to audio bo This is a fascinating book. It is also difficult, filled with jargon, and seems to expect a lot of previous knowledge by the reader. I looked up a lot of words, but even then, I'm not sure the dictionary meanings help in this very technical context. The first seven chapters or so cover the "How We Read" part of the subtitle, and I loved them. I've always been interested in how reading works. Lately I've thought quite a lot of the difference between reading printed pages and listening to audio books, but I've never really delved into the science of it. These early chapters cover how written language developed, how it's related to spoken language in different cultures, and how people learn reading. Really interesting, since reading is one of the more complex mental activities that we all do. I distinctly remember learning to read myself, so I was interested in how kids are able to learn so many words so quickly. I heard Seidenberg speak at a ResearchEd conference in Brooklyn a while back, and I found what he had to say really interesting, but he was a bit kooky and used terms I'd never heard before like "statistical learning," so I wasn't sure what to think, as he seemed to stand outside of the mainstream of education speak. My interest was piqued however, as I happen to also follow the Language Log blog, which he is a contributor to, and in reviewing my notes of his talk, his points continued to jump o I heard Seidenberg speak at a ResearchEd conference in Brooklyn a while back, and I found what he had to say really interesting, but he was a bit kooky and used terms I'd never heard before like "statistical learning," so I wasn't sure what to think, as he seemed to stand outside of the mainstream of education speak. My interest was piqued however, as I happen to also follow the Language Log blog, which he is a contributor to, and in reviewing my notes of his talk, his points continued to jump out at me. So I finally got around to reading his book when I had a coupon on Google Books, and I figured, what the heck. I don't have any time to read much but I should probably see what it's about. And man, am I glad I chipped away at this on bus and train rides over the last 2 weeks. The reason he stands outside of the mainstream, it turns out, is because public education is nearly completely disassociated from research, a point he raises vituperatively in his book. This book should be read by anyone involved in education, whether policymaker, administrator, teacher, or parent. I've been a teacher of special education for 7 years and an administrator for 3, and I am embarrassed to say that Seidenberg lays out facts about reading I had nary a clue about. And he lays it out trenchantly, wittily, and, at times, impassionately, because he sees clearly what a crime it is that the majority of educators similarly have not a clue. Major takeaways: 1) spelling, sound, and meaning interact when reading. 2) phonics is good. 3) we don't know how best to teach reading. 4) neuroscience tells us that certain parts of the brain associate with certain tasks, but we don't know why or how. The book is well written and a bit entertaining. However, the author never provides any insight on how the research cited translates into the neat/clean teaching methods they desire. While I agree with the author that teaching is seen as too much a Major takeaways: 1) spelling, sound, and meaning interact when reading. 2) phonics is good. 3) we don't know how best to teach reading. 4) neuroscience tells us that certain parts of the brain associate with certain tasks, but we don't know why or how. The book is well written and a bit entertaining. However, the author never provides any insight on how the research cited translates into the neat/clean teaching methods they desire. While I agree with the author that teaching is seen as too much art and not enough science, their blame for this is misplaced. Who do they think does the research they discuss (faculty in schools of education). The author assumes that because teachers have not changed, that schools of education have not changed. However, the more accurate reality is that schools of education teach teachers science-based strategies that new teachers quickly let go of in the face of pressure from their colleagues to "not look different". At times mind-blowing and at other times a complete slog. The author was so funny, witty, fiesty, and then completely boring. Seidenberg provided interesting information about language, but I wanted more insights into the best way to teach struggling readers. According to the science (though not clearly explained by the author), phonics is the most important base. Fortunately, I've been using the best parts of three different phonics curricula with my intervention students. Very interesting summary of the state of the art in reading research. The neuropsychology and brain bases of reading section was a bit too detailed for me (I skipped most of chapter 9), but I particularly appreciated the critique of the phonics vs whole language pedagogies and the commentary on how teacher prep programs should prepare teachers to teaching reading but don't and why. Very interesting read about the science behind reading! As a former public school educator, I found his critiques of the education system and culture very impression. Some may find it harsh, he admits that it can come off that way, but he raises many questions as to why the methods of teaching haven't changed with this more in-depth and developing science. I picked this up thinking there would be practical information on teaching reading. The author spends a quarter of his pages bemoaning the lack of scientific proof behind the current methods and the rest of the book describing the way the brain works or doesn't when reading based on scientific studies of live people and computer simulations. Excellent guide to understanding how we read ... and how our minds work. A well-written book containing a great deal of fascinating information. I have seldom read a book that couples bothvwide and deep perspectives about a topic so successfully. As a reading intervention teacher I found this book both interesting and valuable to my work with beginning readers who struggle with learning to read. All educators should read this book. 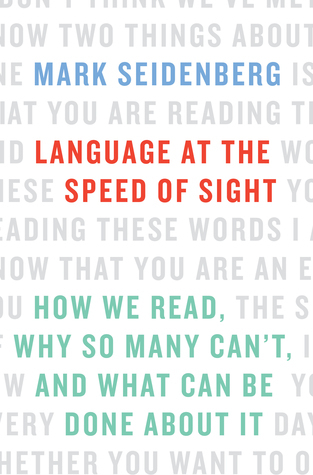 Language at the Speed of Sight: How We Read: How We Read, Why So Many Can’t, and What Can Be Done About It is a refreshing and thought-provoking book, which covered the subject of the literacy gap thoroughly and convincingly. The book provided in-depth analysis of the subject and current research with insights backed up by conclusions drawn from his research and that of others in the field. For the non-academic reader, which is me, it was overwhelming at times, but his occasional humor made the Language at the Speed of Sight: How We Read: How We Read, Why So Many Can’t, and What Can Be Done About It is a refreshing and thought-provoking book, which covered the subject of the literacy gap thoroughly and convincingly. The book provided in-depth analysis of the subject and current research with insights backed up by conclusions drawn from his research and that of others in the field. For the non-academic reader, which is me, it was overwhelming at times, but his occasional humor made the dry parts more readable. I trudged through the chapters on his research studies, but I must say that much of it was not understandable. I discern that what he says is backed up by scientific data and evidence and that he concurs with the conclusions others who have studied the brain and reading. Dr. Seidenberg provides a succinct rationale for why the current system of reading instruction continues to fail many and at times he was rather blunt. His passion for teaching and compassion for students informed his perspective. It certainly answered many questions as to how this situation has come about. What I appreciated the most was the chapter discussing the Two Cultures of Science and Education. I had been aware that the prevailing method and view seems to favor the whole-word approach to reading instruction, and to devalue phonetic methods, but I didn’t understand the arguments. The outlines and tables in chapter 11 present them succinctly. I was astonished to learn there was simply was no scientific evidence to validate whole word. As in, none, nada, zilch. The difficulty comes from the last question in the subtitle. As to the issue of what can be done about it, that gets much more complicated. Short of overhauling the entire educational establishment in the United States, which he argues is out of touch and outdated in outlook, he suggests some demonstrations that could be tried on a smaller scale, which perhaps might then be replicated at larger scale if they were successful. Oh, and he also proposes a system of actual licensing exams that teachers would need to pass to demonstrate competency in scientifically proven instruction methods. "American attitudes toward teachers are frankly incoherent. We want outstanding people to enter the field but provide little incentive to do so. We expect teachers to be able to educate every child, including ones for whom the obstacles to learning originate outside the school. They should be able to do this without adequate training, having figured it out on their own. The educational establishment- from the schools of education, to the school systems, to the state and federal government agenci "American attitudes toward teachers are frankly incoherent. We want outstanding people to enter the field but provide little incentive to do so. We expect teachers to be able to educate every child, including ones for whom the obstacles to learning originate outside the school. They should be able to do this without adequate training, having figured it out on their own. The educational establishment- from the schools of education, to the school systems, to the state and federal government agencies, to the lawmakers- creates conditions that do not allow teachers to be as effective as the could be." This, a book about reading and the science behind reading, has a lot to say about the current state of Education in this country and the need for more connection between Education and the sciences that could inform its theories and practice...why are we relying on intuition? I was especially interested in the third portion of the book, The Educational Challenges. Having explained the history of writing/reading and the science behind learning to read, the author then discusses why so many children seem to struggle to learn this crucial skill. He spells out various causal factors of "achievement gaps" ... poverty, racial minority, bilingual or bidialectal issues, and gaps in educational theory that are failing America's students. Although new research on cognition cou I was especially interested in the third portion of the book, The Educational Challenges. Having explained the history of writing/reading and the science behind learning to read, the author then discusses why so many children seem to struggle to learn this crucial skill. He spells out various causal factors of "achievement gaps" ... poverty, racial minority, bilingual or bidialectal issues, and gaps in educational theory that are failing America's students. Although new research on cognition could significantly impact how students are taught, educators still rely on older (50 years or more, in many cases) theories of educational psychology, many of which have been proven to be ineffective. In reading the chapter "The Two Cultures of Science and Education," I was reminded of a college friend, an Education major, who, when I expressed concern that she would be called upon to teach a subject where I knew she herself performed poorly, blithely told me that she didn't need to know how anything ABOUT the subject, all she had to know was how to TEACH it! This was VERY dense - Seidenberg provides a ton of information in a relatively short book. It's fascinating to understand more of how our brains approach reading and great to have more knowledge to inform how I approach struggling readers.